Dr. Jörn Günther Rare Books AG returns to TEFAF Maastricht (16-24 March 2019) with an exceptional collection of museum-quality, Medieval and Renaissance illuminated manuscripts, miniatures, and early printed books. This year’s highlights focus on the finest French illumination across the centuries and on the ability of true artists to convey stories. The first outstanding manuscript in the TEFAF Maastricht 2019 line-up is a stunningly beautiful French Book of Hours that shows the exquisite refinement and sophistication of two great artists. The amazing Fauquier Book of Hours only recently resurfaced after having disappeared from the public eye for more than 50 years. The manuscript is rich in iconography and subtle in colours, with 13 miniatures of exceptional quality, all of which showcase their creators’ extraordinary storytelling abilities. It was a commission for a gentleman living in the diocese of Besançon, likely a member of the family Fau(l)quier of Poligny. 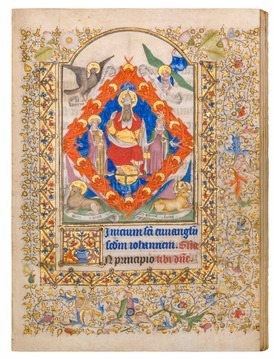 The Master of Walters 219 contributed two miniatures to this manuscript, while the second master, whose style points to Amiens, was responsible for the remaining eleven images. The style of the first illuminator, the Master of W. 219, likely an itinerant painter who came from Lombardy, is marked by ingenuous scenes that are rich in Italianisms and occupied by many small characters. He worked in the context of some of the best of French and Netherlandish traditions, where he may also have met the second illuminator. Another impressive manuscript highlight that Dr. Jörn Günther Rare Books is bringing to Maastricht is a previously unknown and unpublished legal codex from the 13th century, illuminated by the workshop of Maître Honoré. This exciting new find offers a glimpse into medieval customs, since the law reflects the spirit of the time. The present manuscript is a comprehensive compilation of canon law issued by successive popes, including decisions of Church councils, papal bulls, and excerpts from texts by church fathers and theologians. The manuscript is a high-quality, legal textbook executed under the supervision of a university stationer, whose corrective notes (“cor”) are preserved at the ends of some quires. The layout of the manuscript’s pages is typical of a university law book, containing - in addition to the texts of the various constitutions - the Glossa ordinaria, a systematic commentary in the form of marginal glosses. The legal codex features miniatures and decorated initials of the finest quality, which were painted by the hand of the famous illuminator Maître Honoré and his workshop in Paris. The five miniatures stand at the beginning of each book: iudex - iudicium - clerus - connubia - crimen (jurisdiction - procedure - clergy - marriage - delinquency and criminal procedures).